A Kid Again is a 501C3 non-profit organization. Funding is provided by the generous donations from the community. Corporations and individual donors sustain A Kid Again through direct gifts, sponsorship of our adventures, support of our fundraisers and in-kind donations. An impressive 89.9% of every dollar raised goes directly to programs and services for children with life threatening illnesses. A Kid Again is proud to be part of Charity Navigator. 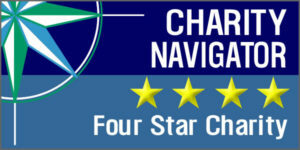 Charity Navigator is America’s largest independent evaluator of charities. A Kid Again has been evaluated according to the 20 BBB Standards for Charity Accountability and meets all 20 standards giving the organization a BBB accredited charity status. By meeting the Standards for Charity Accountability, A Kid Again participates in the BBB Wise Giving Alliance Charity Seal program, giving the organization permission to display the seal. GuideStar USA, Inc. A Kid Again is a Platinum-level Guidestar rated charity by GuideStar USA Inc. is an independent online information service specializing in reporting on U.S. nonprofit companies. In the United States alone, 500,000 kids are battling a life-threatening illness. At any point in time, 5,000 children are living in the last 6 months of their lives. A Kid Again creates an impact year-round on children and their families! View our annual impact report learn more.